The Board of Control for Cricket in India will donate Rs 1 crore to the Prime Minister’s Relief Fund in aid of the victims of the December 26 tsunami that followed the biggest earthquake in four decades. Sri Lanka today pulled out of their cricket tour of New Zealand in the wake of the tsunami disaster, that wreaked havoc across South Asian countries, including this island nation, over the weekend. Bad light denied England victory over South Africa on the fifth day of the second Test here today. South Africa, who needed 378 to win, were precariously placed at 290 for 8 when play was called off. 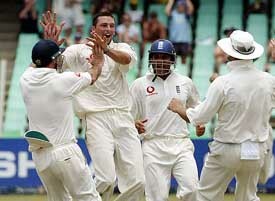 England bowler Steve Harmison celebrates with team-mates the dismissal of South African batsman Jacques Kallis on the fifth day of the second Test in Durban on Thursday. Stuart MacGill and Shane Watson have been added to Australia’s squad for the third test with Pakistan starting on Sunday after Brett Lee was dropped to get some much-needed match practice. Former champions Delhi hold a distinct edge over depleted hosts and holders Mumbai in their crucial and concluding Ranji Trophy Elite Division Group A match, commencing at the Wankhede stadium here tomorrow. As each year passes, the feeling begins to grow that new ones may become even more contentious than the old. The year 2004 that is fast leaving us might, however, prove a hard one to beat for very many reasons. It was a year of thrills and spills for Team India in international cricket even as confusion reigned within the portals of the cricket board. Corps of Signals, Jalandhar, rode on a combination of luck and pluck to hit the jackpot in the 29th All-India Liberals Hockey Tournament, which concluded at the Ripudaman College grounds here today. The Indian Olympic Association will make a bid in the new year to host the 2014 Asian Games in Delhi. Stating this on the phone from Dehra Dun, the Secretary-General of the IOA, Raja Randhir Singh, said in the beginning of January, the IOA would submit a detailed plan bid to host the games. Hosts Punjab, along with current champions Tamil Nadu, last year’s losing finalists Indian Railways, along with Services, Uttaranchal and Kerala, assured themselves berths in the quarterfinals (men) of the 55th Dhanoa Senior National Basketball Championship being played at Guru Nanak Stadium here today. Chandigarh and Punjab entered the semifinals in both men’s and women’s sections in the 26th Senior National Softball Championship at PEC grounds here today. Punjab Armed Police and CRPF will clash in the final of the first Baba Bhag Singh Memorial Football Tournament being held at the Sant Baba Bhag Singh Educational Complex in Padhiana village here. Islamabad, December 30 In a sudden development, Aziz Khan has stepped down as the president of the Pakistan Hockey Federation and has been replaced by Tariq Kirmani, head of Pakistan State Oil. The Board of Control for Cricket in India (BCCI) will donate Rs 1 crore to the Prime Minister’s Relief Fund in aid of the victims of the December 26 tsunami that followed the biggest earthquake in four decades. Announcing this at a press conference here today, BCCI president Ranbir Singh Mahendra said the board was considering other measures to help the people hit by the devastation. Asked if the Indian team would go to New Zealand as replacement for Sri Lanka, who cancelled their tour midway in view of the havoc wreaked by the tsunami in the little island nation, he said the BCCI had not received an invitation from the New Zealand cricket authorities. “They (New Zealand Cricket Board) have not contacted us. I do not want to go into what we will decide if they invite us as replacement for the Sri Lankan team. We will cross that bridge when we come to it,” he said. He refuted media reports that the Pakistan Cricket Board (PCB) had sent letters to its Indian and Lankan counterparts for a benefit one-day match combining the top players of the three countries. The BCCI had not received any letter from the International Cricket Council (ICC) for a much-rumoured Asian XI versus World XI fund-raiser, he said. Regarding the selection of venues for the Pakistan tour, he said the PCB had not made any preferences known to the BCCI. “It is the prerogative of the hosts to choose venues. In any case, they (PCB) have not approached us,” he clarified. “I do not see why there cannot be a (India-Pakistan) match at Mumbai,” he said, replying to a question, referring to the strong presence there of the Shiv Sena, who had dug up the Feroze Shah Kotla pitch at Delhi during Pakistan’s last tour to India in 1999. Mr Mahendra also said the BCCI was awaiting certain clarifications from the ICC before taking a final decision on whether to send Harbhajan Singh to Australia for corrective action on his famed “doosra”. BANGKOK: Russian tennis star Maria Sharapova, here to play an exhibition match against Venus Williams, today handed Thailand’s Prime Minister a cheque for $ 10,000 for victims of the tsunami disaster. She made the donation at the Government House, where she met Prime Minister Thaksin Shinawatra. CHENNAI: Event managers of the ATP World Tour, Chennai Open 2005, which is to be held here from January 3 to 9, will organise a charity auction on January 2 and donate the proceeds for relief and rehabilitation of tsunami victims. IMG’s senior international vice-president Ravi Krishnan said here on Wednesday that items to be auctioned would include Sports Illustrated signed by Wimbledon champion Maria Sharapova, Fila cup signed by Jennifer Capriati, Wilson racket signed by Venus Williams, cap signed by golfer Vijay Singh, T-shirts signed by Kim Clijsters, Justice Henin Hardenne and Lleyton Hewitt, autographed photos of Bjorn Borg and Chris Evert Lloyd and tiger skins signed by Annika Soreenstean. The bat with which Indian cricketer Virender Sehwag scored 309 against Pakistan would also be put up for auction. LONDON: Former West Indies captain and match referee Clive Lloyd has urged the International Cricket Council (ICC) to set up a disaster relief fund for victims of the earthquake-triggered tsunamis, which ravished the coastal belt of South Asia over the weekend. “There is a lot of money in cricket — we should try to contribute,” Lloyd, who lost two close friends in the disaster, was quoted as saying. England amassed 570 for seven declared in their second innings and had looked poised to record their ninth successive Test win. South Africa resumed on 21 for one but lost their second wicket in the seventh over of the day when nightwatchman Nicky Boje (10) fended off a rising delivery from fast bowler Andrew Flintoff to Graham Thorpe at short leg. Herschelle Gibbs and Rudolph fought back for South Africa with a third wicket stand of 54 in which they defended some dangerous deliveries well. 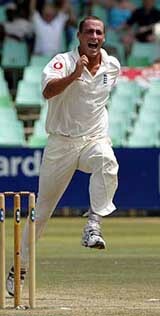 In the sixth over before lunch, Gibbs attempted to cut fast bowler Steve Harmison and was caught in the gully by Ashley Giles. Gibbs scored 36 in more than two hours at the crease. Harmison struck again five balls before lunch when Jacques Kallis played away from his body and edged a catch to wicketkeeper Geraint Jones for 10. Left-arm spinner Giles, who did not bowl in South Africa’s first innings because of a back spasm, had Rudolph adjudged caught off the glove by Andrew Strauss at short leg. Rudolph scored 61, his seventh half-century, hitting eight fours and a six. His dismissal, which came midway through the second session, ended a fluent stand of 69 with Martin van Jaarsveld. Five balls later, fast bowler Simon Jones trapped Hashim Amla in front for a second ball duck as South Africa slumped to 173 for six. Within three overs they were 183 for seven when van Jaarsveld edged Hoggard to Marcus Trescothick at first slip to be dismissed for 49. Both Harmison and Hoggard took two for 45 from 16 overs. The floodlights were turned on 15 minutes before lunch but the light improved and they were turned off. England won the first Test in the five-match series by seven wickets in Port Elizabeth last Tuesday. They have won a record eight consecutive Tests and of the 12 Tests they have played this year they have won 11 and drawn the other. The third Test starts in Cape Town on Sunday. Fall of wickets: 1-12, 2-33, 3-87, 4-103, 5-172, 6-173, 7-183, 8-268. Lee served as 12th man in Australia’s past eight Tests, but the selectors agreed to release him so that he could play in the domestic first-class competition. “We felt that it was unlikely that Brett Lee would be selected to play in Sydney as the three fast bowlers currently in the playing XI were doing a very good job,” Australia’s chairman of selectors Trevor Hohns said today. “So in Brett’s best interests, we feel that it is important for him to get some solid match practice,” he said. Australia used the same team in all four home Tests this summer. Middle-order batsman Darren Lehmann is under pressure to retain his position in the line-up after scores of 12, 5 and 11 in the previous two tests. Even without Virender Sehwag, Delhi look stronger on paper than Mumbai, who are without Sachin Tendulkar, Vinod Kambli, Ajit Agarkar and the injured Sairaj Bahutule. Tendulkar, now back in India along with Agarkar, has not played a single Ranji game for his home association this season and Mumbai have got used to playing without him. But the same cannot be said about the absence of Kambli, Agarkar and Bahutule, who has led them ably this season. Kambli is still on the sick list and Agarkar has decided to take a break, as Mumbai are already into the semifinals with a tally of 21 points, while Bahutule has not recovered from the hamstring pull he suffered against Karnataka last week. Mumbai will be led by left-arm spinner Nilesh Kulkarni, who played a major role in the victory over Karnataka along with his spin partner Ramesh Powar. Delhi, with 12 points and needing at least two more to book a semifinal berth, possess a stronger batting line-up, have a better new-ball attack, spearheaded by the fit-again Ashish Nehra, and have an astute leader in Ajay Jadeja. Mumbai hold a slight advantage in playing at home and have two spinners — Kulkarni and Powar — to exploit a spinning track, but will obviously miss Bahutule as an effective lower-order batsman and for his leg-spin. Bahutule, who did not taste much success with the ball, and the short-statured Powar had rescued Mumbai from a wobbly 67 for 6 in the second innings against Karnataka and placed them on the path to the massive victory last week. The Mumbai top-order failed against Karnataka after having done well in the previous matches. The hosts are hoping for a good start from openers Wasim Jaffer, who has scored two tons already, and Vinayak Mane, against the likes of Nehra, Amit Bhandari or youngster Kunal Lal. “We have not decided whether to go in with four or five bowlers. We have used only four in earlier matches,” Delhi captain Ajay Jadeja told reporters on the eve of the match. The Delhi batting has been strengthened by the inclusion of Gautam Gambhir, who had a largely successful outing in Bangladesh, where he also notched his maiden Test ton. While Jadeja said Gambhir would bat lower down the order, with Akash Chopra and Shikhar Dhawan opening the innings, coach Madan Lal maintained that Gambhir and Chopra would launch the innings. Delhi have two seasoned campaigners in Rahul Sanghvi and Sarandeep Singh, both India discards, to bowl the slow stuff. But they are without regular wicketkeeper Vijay Dahiya, who has stayed back for personal reasons, which gives a chance to Varun Kumar to don the gloves. At the dawn of the year there was a team score of 700-plus in the Sydney Test which represented a realistic chance of downing the world champions in their own den. Before the year was out, Australia had won a Test series on Indian soil after 35 years and the champion, in the appropriate terminology of an Olympic year, keeps going faster, flying higher and getting stronger. There is apparently some doubt over who is actually the president of the BCCI, this in a sport in which the precision of a Sachin Tendulkar straight drive, the correctness of Rahul Dravid in defence and the accuracy of Anil Kumble is setting the standards. We must consider ourselves fortunate that we have such star performers who continue to excel even amidst the disarray. Not even their collective determination could keep the marauding Aussies at bay. The conquest of India must rank as one of the finer achievements of modern cricket even if the rain in Chennai and the green tinge in the pitch in Nagpur smoothened the passage for the Juggernaut to go up 2-0 before Indian clay made a mockery of the Mumbai Test match. Surreal it may all have seemed but then the fact that reality has an inevitable bite to it was proved as prolonged celebrations engendered a smugness in Indian cricketers that is almost unique. The ride into one-day wilderness was like sliding down a water chute, so easy and smooth. The result — a low rating of eighth in limited-overs cricket which is actually more like a fig leaf of modesty as the team stood badly exposed, from Colombo through Birmingham down to Eden Gardens. A 50 per cent strike rate in Tests with two wins out of three coming abroad, the other being a consolation strike at home against a weakening South Africa, is a clear enough representation of the fact that India’s built-up strengths are more likely to fetch rewards in the longer version of the game. Consistency in the one-day game calls for a superhuman commitment that does not come easily to Indians playing in a team cause. Modern cricketers play so much that old milestones have lesser relevance than before. That should not, however, stop us from celebrating the triumph of our stars — Dravid’s awards at cricket’s Oscars and Sachin Tendulkar’s record-equaling 34th Test ton. The rejuvenation of Kumble, who also reinvented himself as a slower leg break bowler of orthodox merits, led to an Indian record number of Test wickets while tugging at the hearts of cricket’s romantics. Like the curate’s egg, the year may have been good in parts for Indian cricket whose problems were, however, dwarfed by those facing world cricket, like the Zimbabwe question and worse, the throwing controversy that will never go away until the game sheds its hypocrisy and rewrites the laws to be accommodative of all aspirations and not only those of the Anglo-Saxons. Every time an individual achieves the phenomenal, like Brian Lara making 400 in a Test innings or an Adam Gilchrist on a ‘walking’ crusade, the game seems to replenish itself at the fountain of youth. Lara also led the West Indies to triumph in the Champions Trophy to lift the unremitting gloom around cricket in the Caribbean. The cherished dream of Signals to annex the title for the first time, since the inception of the tourney in 1976, blossomed under a warm winter when they downed EME, Jalandhar, 1-0. Punjab Cabinet Minister Lal Singh, who was the chief guest, turned up just as the contest was coming to a close. He was supposed to come at 2 pm, when the match was to commence. However, his arrival was postponed to 2.35 pm, when the interval was scheduled. Finally, the minister trudged in with all his men in tow when barely three minutes were left for the match to end. A member of the organising committee revealed that the minister’s arrival was delayed at the behest of local MLA Kaka Randeep Singh, who, it is learnt, was not favourably inclined towards members of the organising committee. It turned out to be a plucky performance by the Signals’ team, who, however, needed lots of luck to end up on the winning side. Signals were all over the place in the first quarter and this superiority was translated into a goal when their nippy forward Christopher K. was felled in the striking circle. The hard-working S.K. Tigga made no mistake from the penalty corner that followed as he swept the ball home. Immediately after the team went into the lead, the opposition came dangerously close to equalising on at least three occasions. However, much to their chagrin, twice the ball hit the crosspiece to ricochet back into play while on the third occasion, striker J.Kindo fumbled in front of an open goalmouth. The first half turned out to be eventful in more ways than one. During this period, there was rough play, but the umpires, Satinder Sharma and G.S. Sangha, controlled the match admirably. The former gave a red card to Gurmeet Singh of EME and S.K. Tigga of Signals. EME, in the second half, were relentless in their effort to squeeze in the all-important goal. They took out a man from their defence and put him up front. However, Signals custodian Imran Khan gave a polished performance and saved his team the blushes repeatedly with his razor-sharp saves. The Indian Olympic Association (IOA) will make a bid in the new year to host the 2014 Asian Games in Delhi. Stating this on the phone from Dehra Dun, the Secretary-General of the IOA, Raja Randhir Singh, said in the beginning of January, the IOA would submit a detailed plan bid to host the games. The final decision on allotment will be made after evaluation of bids from other nations along with India by the members of the International Olympic Committee at its meeting in July, 2005, in China. India had organised the Asian Games back in 1982. Randhir Singh, also an executive member of the IOC, said 2004 was a fortunate year for Indian sport as the country got the coveted 2010 Commowealth Games for the first time. He said since Delhi was already gearing up for the 2010 games, the holding of the 2014 Asian Games would not be a problem for India. He said compared to the Commonwealth Games, Asian Games would be conducted in almost double the number of disciplines and with more participants. Randhir Singh, also the Secretary-General of the Olymplic Council of Asia, said in the OCA meeting held early this year, he had proposed an amendment in the bid duration for the Asian Games. Earlier it was six years and now it had been raised to eight years. Hence, India could make the bid in 2005 for the 2014 Asian Games. He said the 2006 Asian Games would be held in Doha (Qatar) and the 2010 Asian Games in China. The 2008 Olympics will also be held in China in 2008 and for the 2012 Olympics, the candidate city would be announced in July. England, France, and the USA are among the contenders. He said during the past 13 months, the IOA had held two international meets — the first Afro-Asian Games in November, 2003, at Hyderabad and the first India-Pakistan Punjab Games held at Patiala earlier this month. When asked if India was also going to make a bid for the 2016 Olympics, Randhir Singh said India could think of the 2020 Olympics. Punjab cagers, who had a dream tournament till now, defeating reigning champions Tamil Nadu on Tuesday, today thrashed Uttaranchal 73-52. Internationals Yadwinder, Jagdeep and Talwinder Singh played exceedingly well to enable their side to wrap up the match without facing any resistance. Yadwinder contributed 15 points which included four rebounds and two steals while Jagdeep scored 10 points. Talwinder and Vipin Kumar with 9 and 8 points, respectively, enhanced Punjab’s lead. 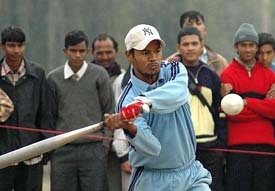 For Uttaranchal, the main scorers were Murli Krishna and Nishant who chipped in with 24 and 8, respectively. However, Uttaranchal managed to make it to the last eight stage. Uttaranchal had scored a stunning victory over holders Tamil Nadu ( 87-84) late last night. Despite a bulk of scoring by star cager Robinson (38 points) and an equal useful contribution from Shivashankar and Sukaneshwar (17 points each), the holders failed to match up to their rivals, going down by a three-point margin. In another match, last year’s losing finalists Indian Railways overwhelmed Andhra Pradesh 78-31 to secure a berth in the knockout stage. The winners were leading 44-15 at half time. For the winners, Mahipal top scored with 17 points, followed by Trideep and Ashwin who netted 13 and 12 baskets, respectively, while Philips accounted for nine points. Cherry (12) fought a lone battle for the losers. The match between Services and Kerala turned out to be an exciting affair in which the former came out triumphant 83-72 after leading 45-38 at the breather. Both teams, however, made it to the quarterfinals. In a one-sided encounter, Karnataka beat Haryana 94-51. In the women's section, Chhattisgarh beat Andhra Pradesh 87-42 and Indian Railways beat Maharashtra 87-36. Chandigarh and Punjab entered the semifinals in both men’s and women’s sections in the 26th Senior National Softball Championship at PEC grounds here today. In the men’s semifinals to be played tomorrow, hosts Chandigarh will cross swords with Punjab while Andhra Pradesh will play against Madhya Pradesh. The semifinals in the women’s category will be between Punjab and Madhya Pradesh and between Maharashtra and Chandigarh. Madhya Pradesh won all their three matches in the super league and occupied the top position in the men’s section. Hosts Chandigarh, despite playing a 4-4 draw with Andhra Pradesh, advanced into semifinals with two victories and one draw. Punjab women also won two matches in the super league. Andhra Pradesh made the grade with one win and two draws. Punjab emerged group leaders in the super league with an all-win record in women’s section. In the first super league match, Punjab women defeated Delhi 6-0, with Satinder and Amanpreet scoring two home runs each. Punjab defeated Kerala 11-1 in a one-sided encounter. Harpreet, Sarabjit and Reena scored two home runs each for the winners. Chandigarh women also won two super league matches. In the morning session, the hosts beat Kerala 10-2. Babita scored three home runs. Monika, Sunita and Nidhi scored two home runs each. Later, Chandigarh beat Delhi 10-1. Neena, Sunita and Snehlata scored two home runs each. After beating Karnataka 13-0 in the opening super league match, Chandigarh men today beat Himachal Pradesh 6-2. Later, Chandigarh were held by Andhra Pradesh 4-4. Results: super league: men: Chhattisgarh b Jammu and Kashmir 4-3. , Andhra Pradesh b Karnataka 12-2, Madhya Pradesh b Punjab 4-3, Chandigarh b Himachal Pradesh 6-2, Madhya Pradesh b Chhattisgarh 7-0, Himachal Pradesh b Karnataka 5-1, Punjab b Jammu and Kashmir 14-0, Chandigarh drew with Andhra Pradesh 4-4; women: Madhya Pradesh drew with Maharashtra 3-3, Andhra Pradesh b Himachal Pradesh 14-4, Punjab b Delhi 6-0, Chandigarh b Kerala 10-2, Maharashtra b Himachal Pradesh 14-0; Punjab b Kerala 11-1, Chandigarh b Delhi 10-1, Madhya Pradesh b Andhra Pradesh 4-3. The first semifinal was played today between Punjab Armed Police and Sant Baba Bhag Singh Memorial team. After a goal-less regulation time, Punjab Armed Police won 5-4 in a penalty shootout. The second semifinal was played between JCT Football Academy, Phagwara, and CRPF, Jalandhar. The CRPF team won 4-3. Mr D.R. Bhatti, ADGP, Punjab Police, was the chief guest. The final will be played tomorrow. Exhibition kabaddi and volleyball matches will also be held. In a sudden development, Aziz Khan has stepped down as the president of the Pakistan Hockey Federation (PHF) and has been replaced by Tariq Kirmani, head of Pakistan State Oil. Aziz resigned from the post saying it was “unfair” to continue following his retirement from the country’s army. “I took charge of the PHF as an army officer. After retiring from the institution, it is not fair to continue. Therefore, I have tendered my resignation, which has been accepted by the Prime Minister,” Aziz told reporters. “The Prime Minister rang me up in the morning and informed me that Tariq Kirmani will be the new PHF president,” he said. Aziz, who was appointed by President Pervez Musharraf in 2000, said he had informed General Musharraf of his decision after retiring from the army in October.